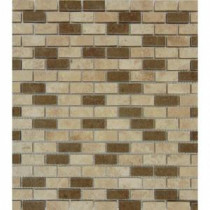 Buy online Noce/Chiaro Mini Brick 12 in. x 12 in. x 10 mm Honed Travertine Mesh-Mounted Mosaic Tile NCCH-MB10MM and leave review or share with Your friends. Add a contemporary style to your decor with the MS International Noce/Chiaro Mini Brick 12 in. x 12 in. Multi Travertine Mesh-Mounted Mosaic Tile. This travertine tile features a medium sheen and a multicolored design with a random variation in tone to help coordinate with your decor. Designed for indoor use, this natural stone wall tile has water absorption of more than 3% but less than 7% and is certified by the Marble Institute of America. 1 square foot per piece, each piece sold individually. Piece weight equals 5 lb.